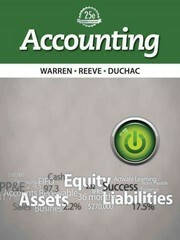 Accounting 25 Edition Activate Learning with Warren/Reeve/Duchac's, ACCOUNTING! For 25 editions, market-leading ACCOUNTING has been on the forefront of innovation and change based on the needs of today's teaching and learning environment. Warren offers students clear guidance to complete homework with an efficient presentation for today's learner. The high impact writing style and streamlined design makes important information accessible, with a focus on providing the best and most complete examples. The Complete Learning System in ACCOUNTING and CengageNOW is built around the way students use textbooks and online resources to learn, study and complete homework, allowing them to achieve ultimate success in this course. New to this edition, the authors created innovative, unique content offering activities that are best-suited for each point in the learning process. New content like the author-written Activation Exercises, helps students come to class more prepared, and enables them to more easily connect the dots, enhance their depth of knowledge and have better tools for remediation and review. The end goal of Warren/Reeve/Duchac's text and technology learning system is to Activate Learning and create more empowered and prepared students--ready to take on the rest of their educational and career goals. Available with InfoTrac Student Collections http://gocengage.com/infotrac.